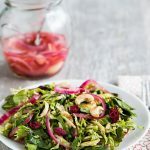 Today I offer you two new recipes. First up is my brand new favorite way to cook okra. But, get this: E. the Okra Hater actually liked it, too! I couldn’t believe my eyes when I saw her picking it up and eating it like popcorn. (In fact, she liked both these dishes, amazing for someone who claims not to like Indian food.) Prepared this way, okra is definitely not slimy! Okra fried without oil takes a long time to brown and must be stirred fairly frequently. If you’re in a hurry, you can add more oil to this to speed it up or spray it a couple of times with cooking spray. To avoid the dreaded “okra slime,” thoroughly dry the okra (and your cutting board) before slicing it. Moisture brings out the slime. Spray a non-stick skillet with cooking spray and put 1/4 teaspoon of oil right in the center. Heat on medium until pan is warm. Add the cumin and mustard seeds right to the center of the oil and fry for 1 minute, or until they begin to pop. Add the onion and garlic and stir for 2 more minutes. Add the okra and remaining spices. Stir well and cook, uncovered, until browned on all sides. Prepare to spend at least 20 minutes, stirring every few minutes, for the okra to cook completely. Sprinkle with salt and serve. Makes 4 servings. Each contains 58 Calories (kcal); 1g Total Fat; (10% calories from fat); 3g Protein; 11g Carbohydrate; 0mg Cholesterol; 11mg Sodium; 4g Fiber. You know how you buy exotic seasonings and then don’t exactly know what to do with them? I’ve had a jar of ajwain seeds in my spice cabinet ever since my last order from Penzey’s. 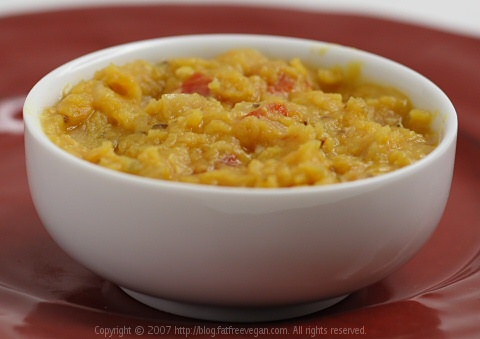 I finally decided to just give them a try and added them to this very simple dal made from the quick-cooking masoor dal, a type of split red lentils. The flavor of ajwain is similar to thyme, which you can substitute if you haven’t got ajwain. Thyme, however, doesn’t need to be fried in the hot oil–just add it directly to the dal. 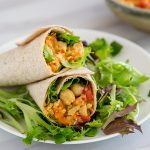 Red lentils will also work here, but they may take a little longer to cook. Pick over and rinse the lentils and add them to a pot with the water and turmeric. Bring to a boil and reduce heat to low. Simmer until the dal is tender, about 20 to 35 minutes. When done, add salt and set aside. Put the 1/8 teaspoon oil in the center of a non-stick pot and heat over medium-high. When hot, add the ajwain and cumin seeds and cook for 1 minute. Add the onion and cook until translucent. Add the ginger paste, garlic, and tomato and cook until the tomato is softened. Add the dal to the tomato mixture and stir well. Cook for 15 minutes, until flavors have blended. Serve with rice or your choice of Indian bread. P.S. An added benefit of ajwain is that it’s supposed to ease “digestive discomfort.” So eat up those ajwain-enhanced legumes! Makes 4 servings. Each contains 181 Calories (kcal); 1g Total Fat; (4% calories from fat); 14g Protein; 31g Carbohydrate; 0mg Cholesterol; 549mg Sodium; 15g Fiber. Sorry, this is a bit late! I tried this Dal recipe and really enjoyed it. Two things, though. I thought 3 cups of water was plenty and I used 2 tablespoons of olive oil instead of 1/8 TSP. I have never seen someone saute anything in as little as 1/8 tsp of oil. Other than that, good recipe! Haha! Woops… I didn’t read the name of the website. I remain skeptical of the 4 cups of water, though. I love your blog! I made the spicy eggplant tofu from your blog and just curried the tofu before i made it with a little bit of masala and extra ginger. My husband is really health conscious being a firefighter, but I do not enjoy the indian ways of cooking eggplant so that recipe was a winner for both of us. 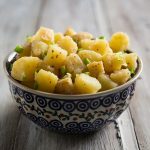 I had a comment about using ajwain: try it in potato salads! 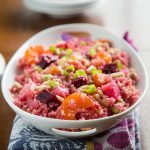 My favourite way to use this ingredient to add to kidney beans with lots of fresh tomatoes, and green chilis with a few tablespoons of sugar – it becomes a simple but sophisticated and really satisfing dish. I also use ajwain in baked beans in tomato sauce. I have found it!! A new way to prepare okra. I have been cutting and eating okra from the garden for months now and am tired of saute’d, dredged and fried and steamed. This sounds sooooo good and I will make it this Thursday when I cut okra again. 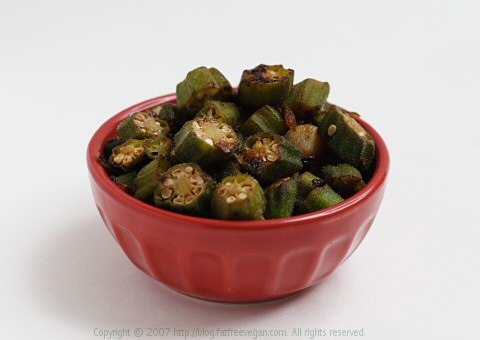 Dave, if you haven’t tried roasted okra yet, hurry over to this page and check it out: https://blog.fatfreevegan.com/2006/08/roasted-okra.html. It’s the easiest way in the world to cook okra, and it’s so good that even my daughter loves it. I’ve been eating okra like this (or very similar) for quite some time (can’t tolerate the slimy methods) but I’m going to try your roasted recipe. I’ve never done that with okra. I love anyone who takes the time to develope fat free nutritious food that I can eat with my high cholesterol. I have just made a fat free or as near as fat free curry that went down a bomb with my friends.